When an incredibly tall man interrupts Nicola Berry’s incredibly boring geography lesson, she’s sure that something fantastic and unexpected and unusual is about to happen… and she’s right. The King and Queen of the planet Globagaskar have gone on holiday leaving their spoilt daughter, Princess Petronella in charge. The bored Princess decides to turn Earth, the holiday destination of choice for the discerning Globagaskarian, into a rubbish dump. Armed with ten important questions devised by the Save the Little Earthlings Committee, Georgio Gorgioskio is dispatched to find the Earthling Ambassador, the only person in the galaxy who can change Princess Petronella’s mind. At Honeyville Primary School he discovers Nicola Berry, an ordinary girl about to embark on an extraordinary mission. 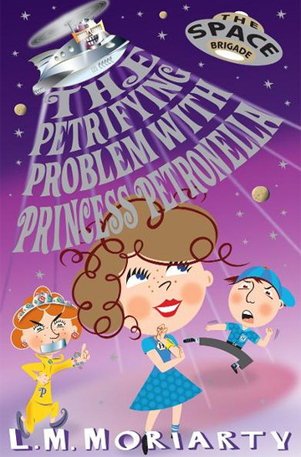 Will Nicola and the Space Brigade be able to change Princess Petronella’s mind in time to save the world? Or will Nicola Berry be left with egg on her face – literally?